To coordinate guest processing activities, Veeam Backup & Replication deploys a runtime process on the VM guest OS. The process runs only during guest processing and is stopped immediately after the processing is finished (depending on the selected option, during the backup job session or after the backup job completes). From the Guest OS credentials list, select a user account with local administrator privileges on the VM guest OS. If you have not set up credentials beforehand, click the Manage accounts link or click Add on the right to add credentials. For more information, see Guest Processing. Local accounts do not support Kerberos authentication. To authenticate with Microsoft Windows guest OS using Kerberos, specify an Active Directory account. By default, Veeam Backup & Replication uses the Log on as a batch job policy to connect to guest OS. If the connection fails, Veeam Backup & Replication switches to Interactive Logon. Networkless application-aware guest processing through VMware VIX/vSphere Web Services is not supported for VMs with guest OS where NTLM is restricted. Veeam backup infrastructure machines (backup server, repositories, backup proxies, guest interaction proxies, etc.) must correctly resolve FQDNs of guest operating systems. To back up VMs where Kerberos is used, NTLM must be allowed in the Veeam backup infrastructure machines. For details, see Kerberos Authentication for Guest OS Processing. 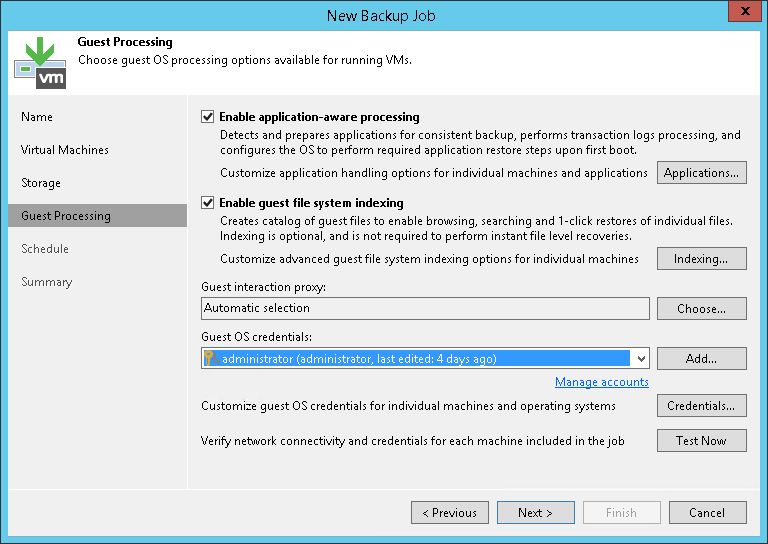 By default, Veeam Backup & Replication uses the same credentials for all VMs in the job. If some VM requires a different user account, click Credentials and enter custom credentials for the VM. If you have added Microsoft Windows VMs to the job, specify which guest interaction proxy Veeam Backup & Replication can use to deploy the runtime process on the VM guest OS. On the right of the Guest interaction proxy field, click Choose. Leave Automatic selection to let Veeam Backup & Replication automatically select the guest interaction proxy. Select Use the selected guest interaction proxy servers only to explicitly define which servers will perform the guest interaction proxy role. The list of servers contains Microsoft Windows servers added to the backup infrastructure. To check if Veeam Backup & Replication can communicate with VMs added to the job and deploy the runtime process on their guest OSes, click Test Now. Veeam Backup & Replication will use the specified credentials to connect to all VMs in the list.